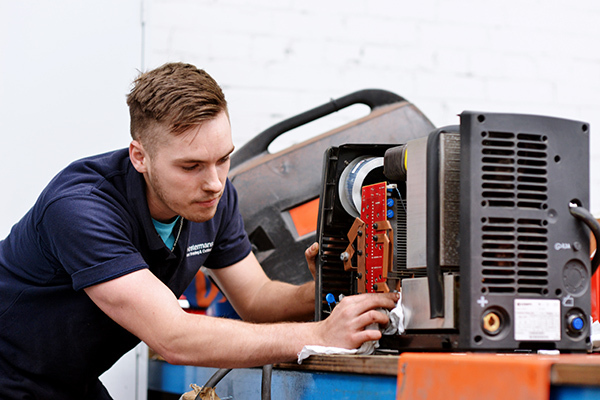 Whilst researching this very subject of young welders and engineers I stumbled across many web sites dedicated to helping students to gain an in-sight into the many areas of welding and engineering with lots of chances to experience the workplace. There are also many grants and incentives out there if you ask to help you achieve your goals. Published recently was an article that stated “With almost every UK city containing global engineering company, it’s important for the whole science and technology community to pull together to make sure that the benefits of careers in engineering are communicated effectively to young people” and this is certainly showing by the number of British firms who are opening up Apprenticeship Schools like Caterpillar and Rolls Royce. The Minister for Business & Enterprise, Mark Prisk, and the Minister for State for Further Education, Skills and Lifelong Learning, John Hayes recently chaired a meeting on this. The vast majority of companies represented already work with Engineering UK in some capacity to reach the people who can really make a difference to the future of UK manufacturing and engineering: our young people. It was noted that businesses know what opportunities lay ahead for UK manufacturing and engineering; they know they are going to need a skilled workforce to realise them; and the majority know that collaboration on programmes that will inspire young people and equip teachers are key to revitalising and sustaining UK business and industry. But what they need from Government is support. It is clear that as a Country we need to secure the talent pipeline on a national scale. With the collaboration of the wider engineering community, with programmes such as Tomorrow’s Engineers and The Big Bang inspiring our future workforce the length and breadth of the UK it can be done. There have been a couple of important milestones recently. The launch of the Tomorrow’s Engineers “Around the World” careers outreach programme took place at a school in Birmingham. This is the product of a brilliant collaboration with engineering firms E.ON, GKN, Goodrich, Jaguar Land Rover, National Grid, Rolls-Royce and Severn Trent. Combining strengths means that we can provide 13-14 year-olds with a powerful and effective introduction to the exciting opportunities offered by engineering careers, backed up by careers information and resources. The activities are fun and linked to the curriculum so that pupils can see how their design and technology, science and maths subjects really apply to the world of work. Crucially, the involvement of large but local engineering companies gives young people an understanding of the real-life employment opportunities that will be available close to home. You can see pupils’, teachers and companies’ reactions to the Tomorrow’s Engineers pilot on the Tomorrow’s Engineers YouTube channel. Working in this way with companies and professional bodies, Tomorrow’s Engineers has the potential to reach hundreds of thousands of new learners every year and to influence even more through the use of its evaluation scheme and careers resources. The Big Bang UK Young Scientists & Engineers Fair is the largest celebration of science, technology, engineering and maths (STEM) for young people in the UK. The aim is to show young people (primarily aged 7-19) the exciting and rewarding opportunities out there for them with the right experience and qualifications. The next step is to reach out to even more and on a local scale with The Big Bang Near Me Fairs, from the top to the bottom of Britain. Involving local business, charities and education providers, the Near Me Fairs enthused and inspired another 20,000 pupils and teachers about science and engineering careers. You can take a look at some of the action at The Big Bang YouTube channel. These UK-wide Fairs are now an integral part of The Big Bang programme and, with the introduction of local and school Fairs, the combined efforts of the engineering community are making an impact right where they are needed – everywhere.